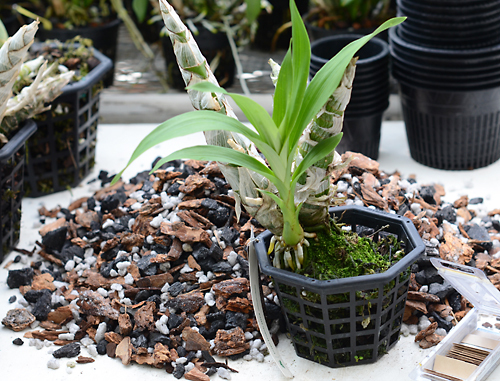 Orchid repotting starts early here--in February. 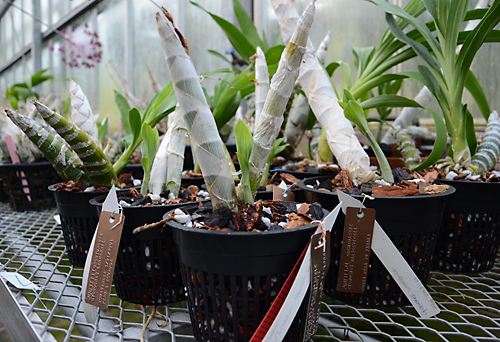 The catasetums and their relatives (Mormodes, Cycnoches, Clowesia) are always first off the mark, producing new growth before any other group of tropical orchids. 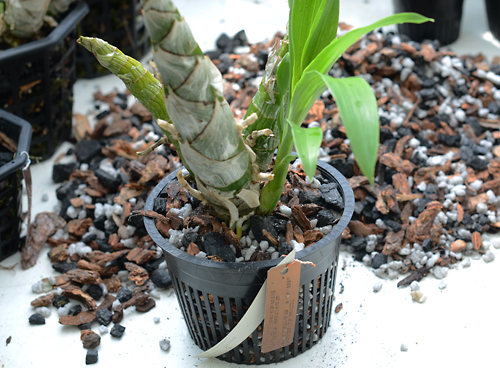 For these guys, there is a window of opportunity for repotting, an optimal time between the appearance of the new shoot and the maturing of the new pseudobulb, that lasts only about a month. After that it's too late. If we miss that window, we have to wait another year. 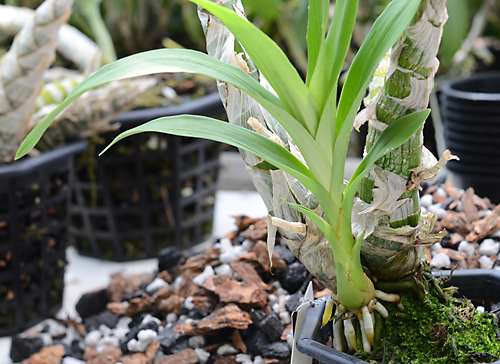 Because the Catasetinae repotting season coincides with Orchid Daze, sometimes it's a race to finish repotting them before the window slams shut. 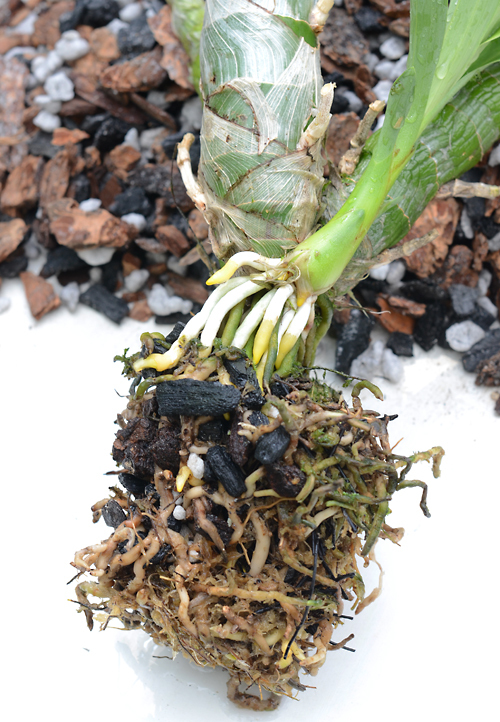 As you can see in the photo above, I'm running late on repotting: the basal part of the new new shoot on our Mormodes has already begun to thicken and the new roots are at a dangerously fragile stage in their development. They break so easily! 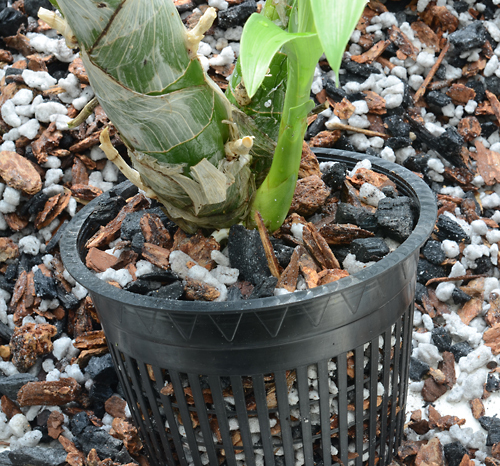 We have been growing our catasetums, cycnoches and mormodes in a bark based mix (which they prefer here) in net pots with large openings. To keep the bark from emptying out the bottom, we have been lining the net baskets with moss--with unhappy results. The moisture in the sphagnum produces a spectacular growth of mold on the bark. Eww. Time for a new approach! 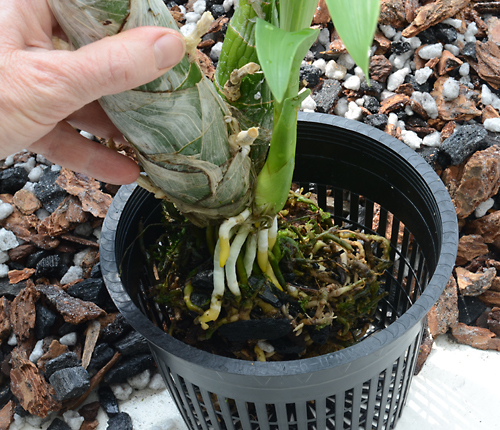 First, I wash the root mass to gently remove some old potting medium and to expose the roots. 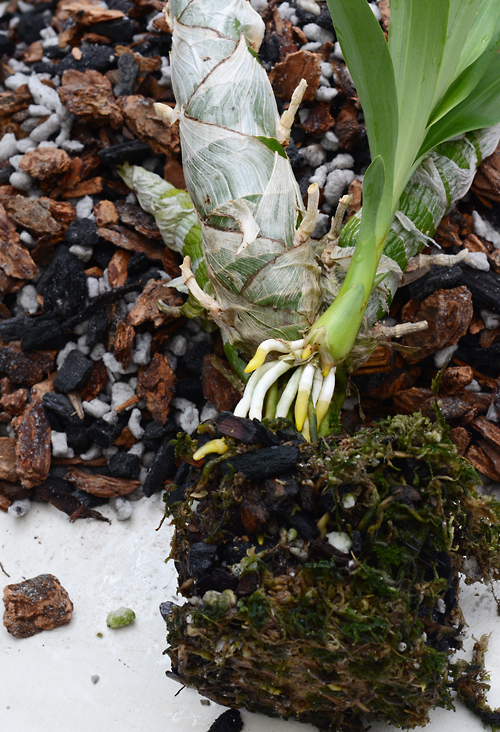 It then becomes easy to see that many of the roots attached to the older pseudobulbs have died. This is typical. Catasetums have a strongly annual growth cycle and put a tremendous amount of energy every year into new root and shoot production. Many of the older roots shut down at the onset of dormancy. I cut those away with a clean razor blade. This year I'm using using net pots with smaller holes. No moss is needed as a liner. That should eliminate the mold problem. The new net pots are manufactured for hydroponic growing. Next, I center the new shoot in the pot, with the older growths against the side. I hold the plant in my left hand as I fill the pot with mix using my right hand. The potting medium is equal parts fir bark, charcoal and sponge rock. We make the mix ourselves from the individual components.I like to rinse the bark under running water beforehand to remove the dust and sediment sized particles. The label and data card goes on last. Labels are always attached to the pot with telephone wire --plastic coated 22 gauge copper wire. We can't risk losing the data. An afternoon's repotting. There will be more next week! You're welcome! And good luck with your repotting, too!